~ by christhehumanist on July 15, 2012. Technically, atheists positively deny the existence of God. That is, they believe in something which they also have to way of proving, that there does not and never did exist a conscious, creative force which somehow caused the universe. And agnostics believe that knowing the truth is impossible. They have no real basis for this belief either. Why should we even bother with any of these beliefs? Hey Jeremy, thanks for taking the time to read and post a comment. 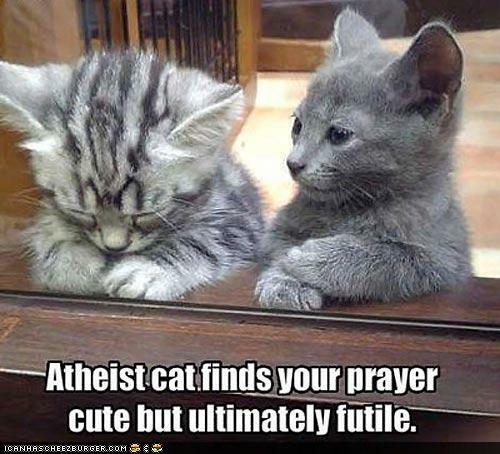 Technically technically, atheists reject the belief in a god, rather than believe there is no God, but I contend that in the end, it’s basically the same thing. But then again I don’t believe that the Easter Bunny exists, and yet I have no need to create a title as an “a-easter-bunny-est.” I think that most people who do not believe in God vocally identify themselves as atheists because of their concern about religion. I think that is why we bother with these beliefs, so to speak. I respect agnostics just as I respect Christians, Muslims or anyone else, and, having been there myself, I view agnosticism as a step along the path, but ultimately I think that everyone must make a call on the God issue, because whether or not you believe in a God affects the choices you make in life, which in turn affects the world. On the other hand, being technical, I have to technically be agnostic because you cannot prove that God does not exist, so there is always that possibility that there could be a God. That does not mean, however, that I am shaky in my non-belief nor, do I actually think that there might be a God. There could also be an Easter Bunny. But I am still confident enough in the evidence that we do have about the Universe to make a personal call and say that God does not exist. The point is that we are having civil conversations about this, and I believe that is key to saving the world. Thanks for your time. ah so Pilgrim ….”. a rose by any other name .”…..
Jesus said those who deny me here on earth I will deny before my father who is in heaven. So you don’t have a choice not to believe by sticking your head in the sand. Lucifer will claim you as his own, you only have short time in the physical world but a very long time in the spiritual world. So go ahead disbelieve and make lucifers day.God have mercy on your soul. Thank you Chris, you have a beautiful way of explaining what I feel in my heart but would never say in public. In much of the world, it is filled with close minded sheep that listen to one religion or another. You must be very careful, they preach love and peace but most can commit horrible acts of violence in the name of their God and tell themselves they will be rewarded by him. The whole 72 virgins thing, Christians can be just as extremist. You talk about freedom in America but you are very wrong about that. The Christian extremists rule the land, your money even says “In God We Trust”. Religious freedom is only for those who believe in religion, you won’t get a tax break for atheism and you will not be allowed in the military if you don’t say the oath to God and country. You are on the right track to claim your religion as humanist, even if they don’t know what it is they see a religious label they can understand. If the not so peace loving Christian God lables you as the enemy for not believing in him then you are fair game to them. And when I say God lables you, I’m talking about the wolf who says he speaks for God to all his sheep. God is not real but the power he has over people is real. Religion was invented thousands of years ago by making up stories to teach their children how to behave in the community and then used by the first wolves to control the people. Look how well the Egyptians worshiped Pharaohs as living gods for thousands of years. The oldest religions should have more credibility then the new ones. They were here first, and closer to the time they say the world was created. Or is it the newer the religion, the more right they get it? If so, are Mormons more likely to be right than Catholics? I don’t believe either is right but can never figure out how they justify saying there’s is the only right one. What is the difference between a religion and a cult? Is it a measure of power or influence? I find it funny to think about “believers” who read thes comments and get upset and want to lash out in a way that is not very Christian. But then again, all they need to do is repent and all is forgiven. If you look at Lawrence Kohlberg’s stages of moral development, you notice that those that are most devout stay in the early stages of development and never move past what is moral maturity of an adolescent. While for an atheist to stay a good person they must do it by maturing to a higher understanding of morality that they act as they do because it is the right way to act and not for fear of punishment from some God like a parent controlling a young child. It looks like Dennis is stuck in this most basic form of moral development and unable to recognize right and wrong without a wolf leading him by the nose. I do know that it is wrong to pick on Dennis and his immature thoughts but I have not obtained the highest level of universal ethics myself and find it within acceptable social norms to point out his inadequacies in a hope to improve society as a whole. As a side note, it looks like only Jesus can obtain the highest level of moral development for believers and everyone else leaches off of him. But any atheist is free to reach universal ethical principles themselves. In fact you can’t move on morally if God has to tell you right from wrong. It also seems to be the Abrahamic religions (Judaism, Islam and Christianity) that control the moral development of its followers so strictly. This highest level of moral maturity is beyond the capabilities of most people and may be beyond me, at lest for now. The level of empathy required to understand others point of view is a talent that might not be able to be learned or at least very difficult.